Off-road enthusiasts are told to replace their harnesses every two years. For racing, SFI tags only last two years from the date sold, and need to be replaced if you want to pass tech. Most of us (hopefully) know this. But why is it two years? Are the belts really “unsafe” after that time? If you’re just driving for recreation is it really that big of a deal? We provide some answers to these all too commonly asked questions. The basis for the two-year life expectancy comes from SFI. For those of you that don’t know, the SFI Foundation is the not-for-profit organization that sets standards for safety equipment in the American racing industry. Those standards are set to make sure the equipment will function properly and ensure the safety of drivers. Whenever buying equipment, look for the SFI tags to be sure that its high quality and meets racing standards. Why does it matter? It’s so we as a consumer can make sure we’re buying equipment that’s approved for our races. But more importantly that the equipment has been tested and proven to be safe; that it will actually work as advertised (i.e. that cheap Chinese fire-suit that isn’t actually “fireproof”). 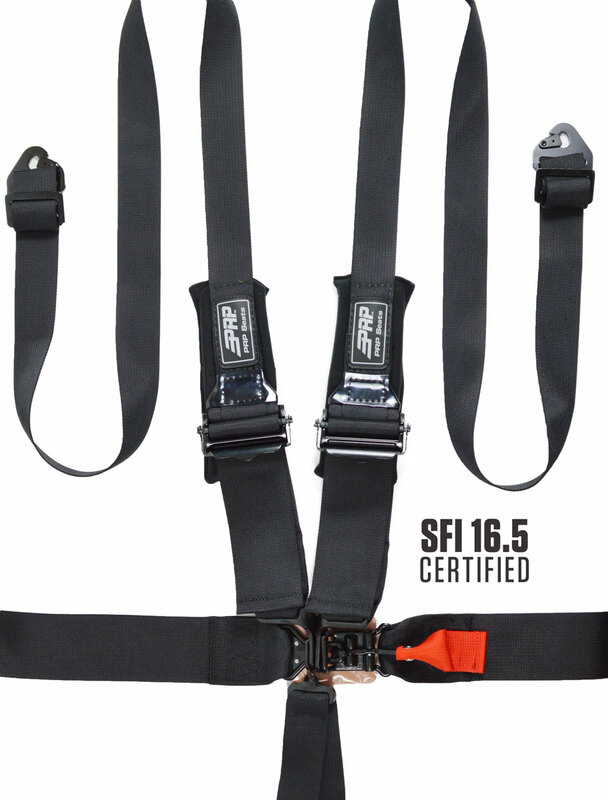 For Harnesses, SFI has 16.1, 16.2, and 16.5 manufacturer certifications. Which harness do you need? Depends on what your racing sanction requires. We’re going to focus on 16.1 because it’s the most widely adopted by off-road sanctions and sold the most by manufacturers. 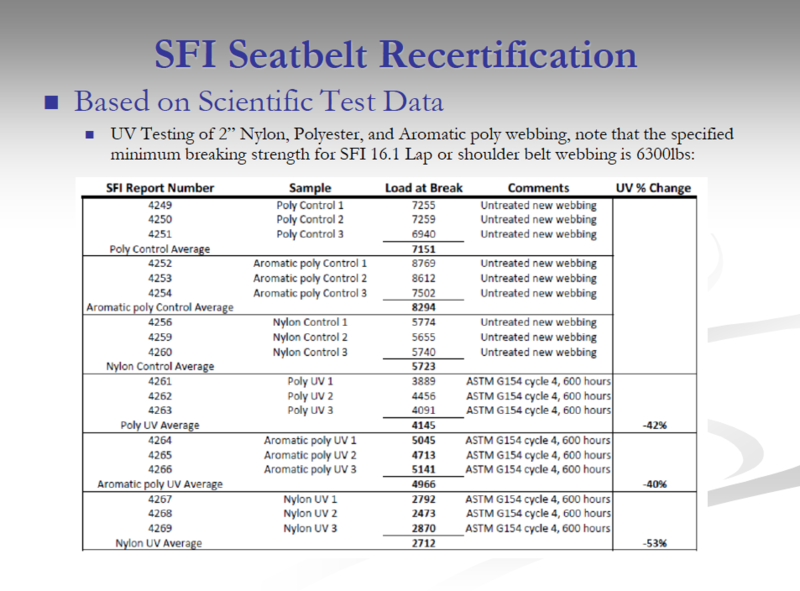 When testing for 16.1 certifications, SFI receives a complete 5 or 6pt harness with some extra webbing samples from the manufacturer. 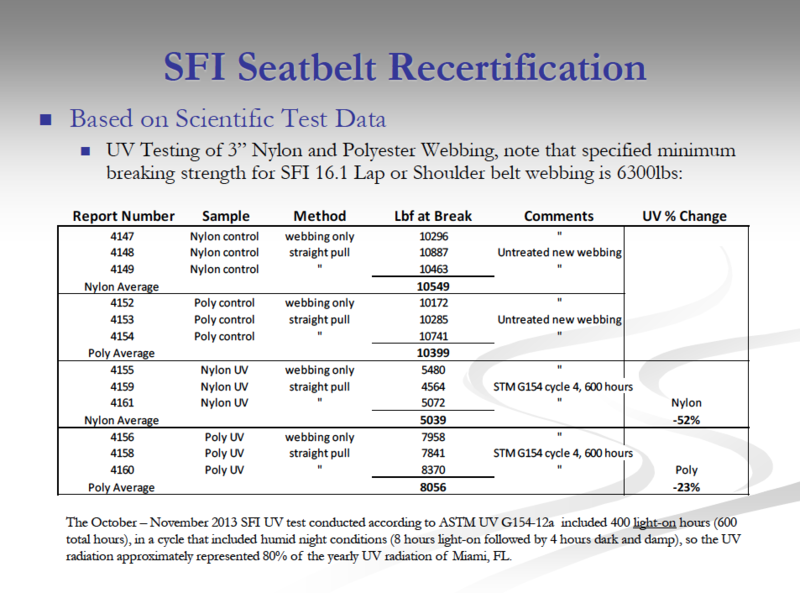 SFI criteria consist of testing the breaking strength of an individual webbing sample, and entire harness assembly by using a modified block that simulates a torso. SFI 16.1 applies a load over the body block of 5,750lbs each on the laps and shoulders and over the complete 5 or 6 point assembly. Webbing test (breaking load) must meet 6,300lbs for laps and shoulders and 1,500lbs for sub straps. SFI labels on left shoulder belt, left lap belt, and sub strap. Breaking strength of a harness is important in a crash. While the average person may only weigh 160lbs, the faster you’re traveling and the shorter distance you stop, the greater the force is going to be on the harness as it tries to keep your body in place. SFI decided on these numbers after various testing and taking into consideration the speeds achieved during races. Over a prolonged period of time, the webbing material the straps and belts are made of start to lose their strength. UV exposure is the most direct cause of this. Ever had a lawn chair that sat outside for a few years? After a while the liner of it became weathered and started to fray…. the same thing happens to harness straps over time. So in a nutshell, don’t leave your vehicle outside and exposed all year long. 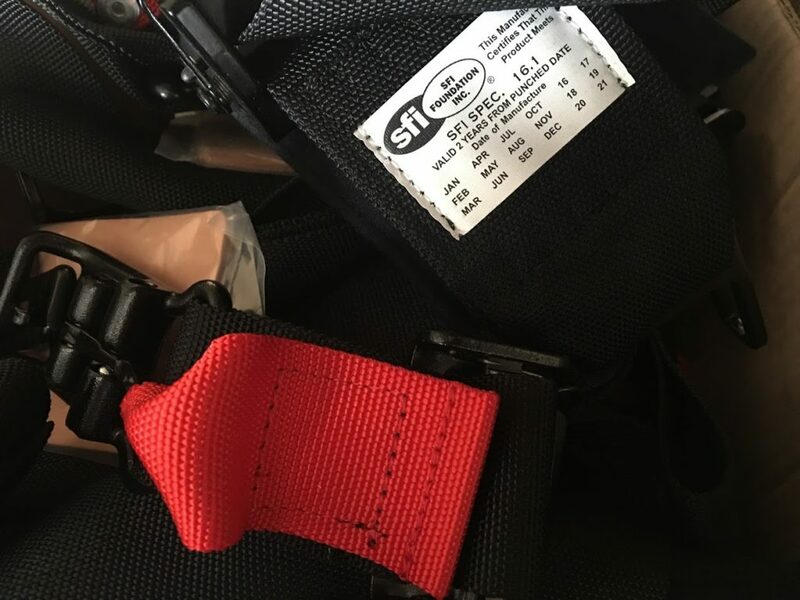 For their experiment, SFI tested the breaking strength of two most common materials used to make harness straps—Nylon and Polyester—with both 3″ and 2″ straps. SFI tested new materials as a control, and materials after a UV exposure cycle to show the loss in strength. Both new nylon and new polyester start with similar strength at 10,549lb and 10,399lb respectively. The difference shows after each is put through UV exposure. Nylon loses 52% of its strength, breaking at 5,039lb. Polyester does much better, only losing 23% strength and breaking at 8,056lb. Remember, SFI’s minimum requirement is 6,300lbs. Polyester webbing is the only one which holds up under the UV test. 2″ webbing loses up to 53% of its strength putting it below the basic SFI standards. New polyester starts at 7,151lb and new nylon at 5,723lb. With the minimum requirement at 6,300lbs, new 2” Nylon does not even pass. After UV exposure Poly loses 42% strength and breaks at 4,145lb. 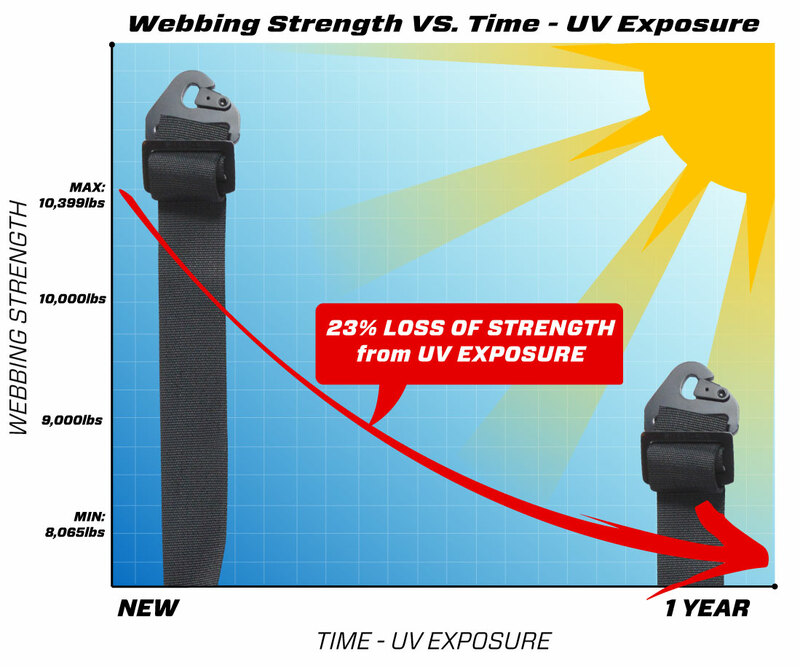 UV Exposed Nylon loses 53% strength and breaks at 2,712lb. Both are well under the SFI minimums after UV exposure. UV exposure is a much bigger factor than most people think. SFI’s estimates their UV exposure tests to be equivalent spending 80% of a year in Miami, Florida: 600 hours (400hrs direct light). Which honestly isn’t that much. Think about how many hours your car is out of the garage before a trip, while traveling, during the trip, and then again on the way home and during clean up. Now all of that combined over a year’s time. It adds up. It’s time to change your belts! The data shows that belts can lose a significant amount of strength just over the course of 2 years. Those 10 year old belts definitely aren’t safe anymore, for racing or recreation. How much force are we talking? The 6300lbs SFI standard seems like a lot of force. But how much is that in real world terms? We did some searching and found a calculator for the force exerted on a driver during a crash. 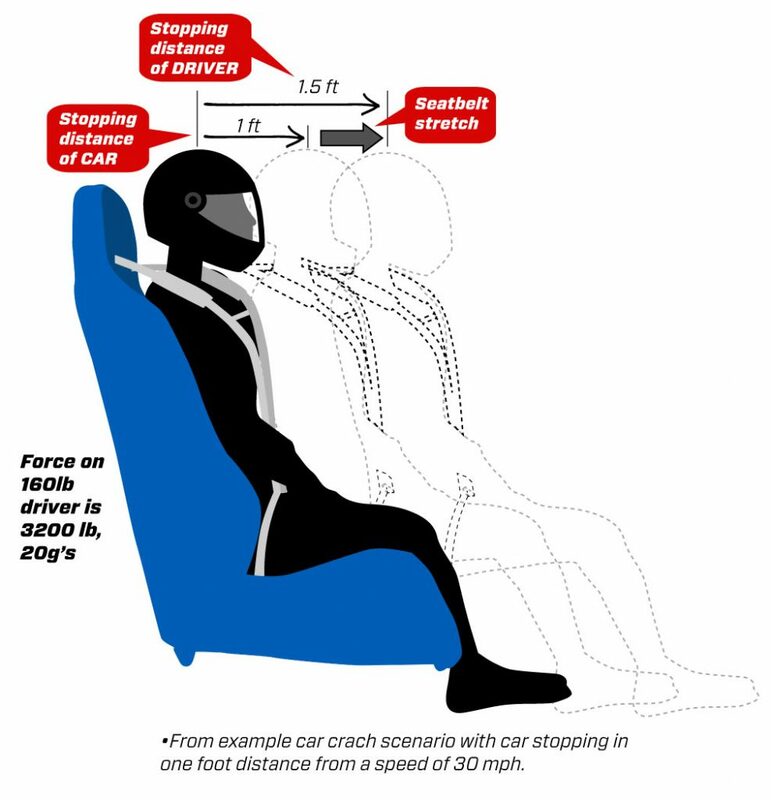 A 160lb person, going 35mph with a stopping distance of 1 foot (the equivalent of hitting a wall or two vehicles head-on at 17.5 mph) produces 6,556lbs of force on the driver and belts. That’s not very fast, but that is a lot of force. Add to that the fact most off-road drivers are well over 160lbs and you have a recipe for disaster if your belts are older than a couple years. SFI’s recommendation makes more sense now. Their main focus is safety and they need to set the requirement to cover the high speeds achieved during racing. Even if your car is only getting a tiny amount of UV exposure, it’s still losing strength over time. A lot of force can occur during a crash. Take into consideration the speeds at which these vehicles operate while racing. SFI 16.1 covers everything from 170RZR’s topping out at 30mph, to 1000hp Trophy Trucks going over 130mph. What if I’m only driving for recreation? The same considerations apply. While it may not be required for you to change out your harnesses every two years, the deterioration of the belts affects you just the same. And as shown above, even a 35 mph crash produces significant force. So keep that in mind. One important point to note is all of the webbings tested were untreated. 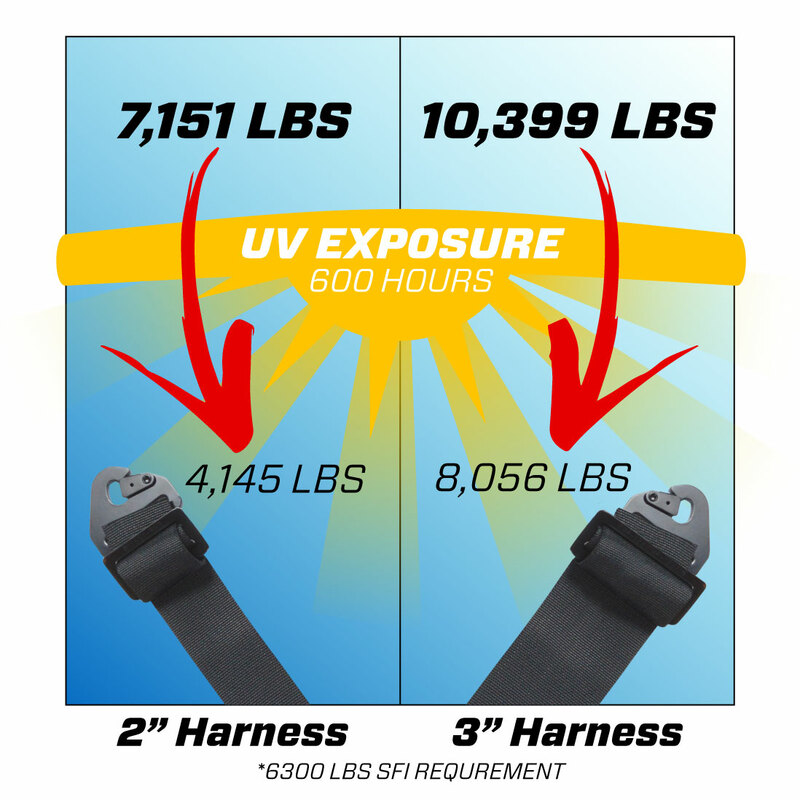 Most harness webbings on the market today receive a UV treatment to help prevent loss from exposure. 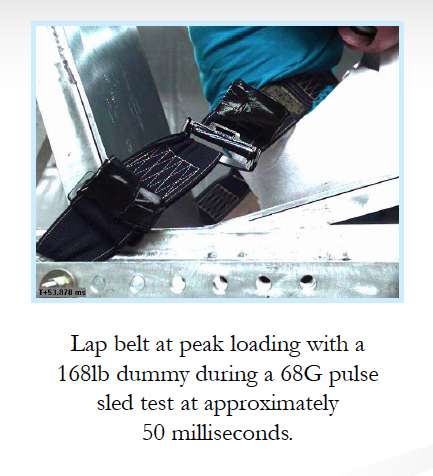 Make sure your Harness is installed properly: In an ideal world, the belts will pull flat and evenly. In reality, this doesn’t happen, the belt can “dump” to one side where it connects to the hardware. Reducing the amount of load it can take. Try to make sure your straps are as close to the ideal angle as you can get them to prevent this. Polyester held up a lot better than Nylon after exposure. The reason is that Nylon is known to absorb moisture, and loses some of its strength when that occurs (approx 12%). Polyester materials repel water, and don’t lose that strength, and retain their ability to stretch. For this reason, Polyester belts have been almost universally adopted in off-road harnesses; where we deal with a lot of water, mud, and sometimes even snow. Three-inch belts started out with and maintained better strength than two-inch. Polyester 3” only lost 23% strength, while 2” lost 42% and failed requirements. Both Nylons lost 52-3% and ended with failed requirements. New 2” Nylon didn’t even meet requirements in the first place. 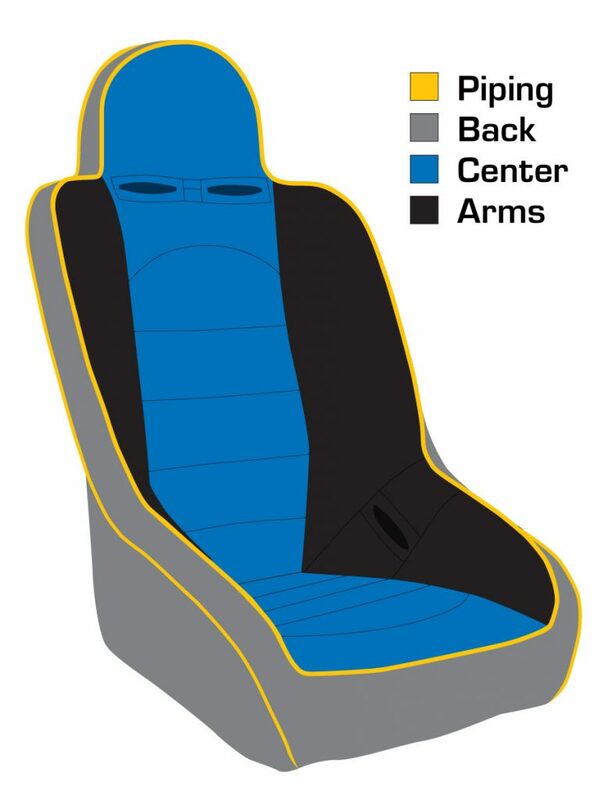 This is why even though there are 2” harnesses that are SFI certified, most races require 3-inch. 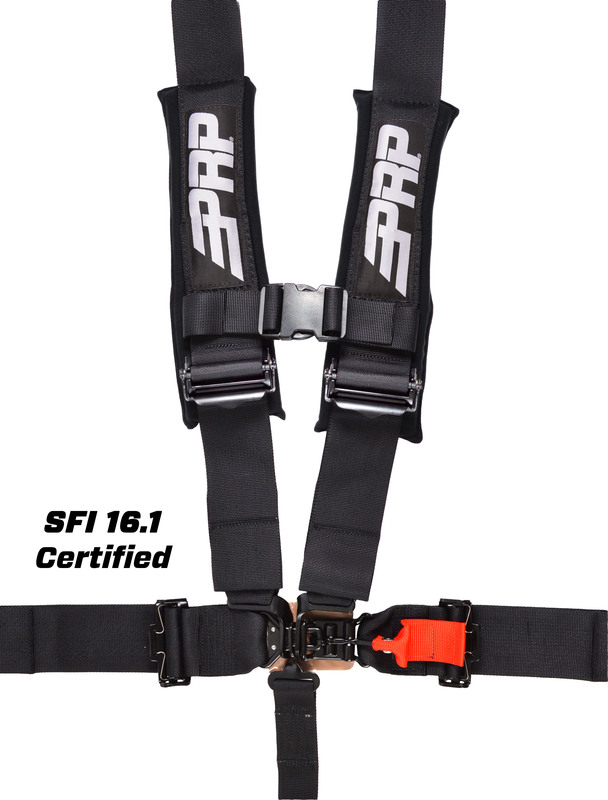 (Ultra 4 requires SFI 16.5 certification for 2” Harnesses). 2-inch harnesses are used in many youth races because they sit better and are more comfortable for kids and because the speeds are not as high. We’ve witnessed, first hand, people crashing UTVs, Buggies, Jeeps, and Trucks. Not to mention the thousands of videos on the internet. In this sport, everyone will eventually be involved in some kind of accident. The next time you prep, take that extra minute or two and check your equipment. Make sure it’s installed correctly. Make sure it’s in good condition. Make sure you’re wearing it correctly (no loose straps). Above all, make sure the SFI expiration has not passed. The job of a harness is to protect you in the case of an accident, make sure its able to perform when that time comes. This entry was posted in FAQ, Tips and tagged Harness, Replace Harness, SFI 16.1, SFI 16.5.